Server-side encryption (SSE) for Amazon SQS is available in the AWS GovCloud (US-West) Region, in addition to all commercial Regions where Amazon SQS is available, except for the China Regions. You can enable SSE for a queue to protect its data. For more information about using SSE, see Protecting Amazon SQS Data Using Server-Side Encryption (SSE) and AWS KMS. All requests to queues with SSE enabled must use HTTPS and Signature Version 4. When you disable SSE, messages remain encrypted. You must receive and decrypt a message to view its contents. In this tutorial you learn how to enable, disable, and configure SSE for an existing Amazon SQS queue. 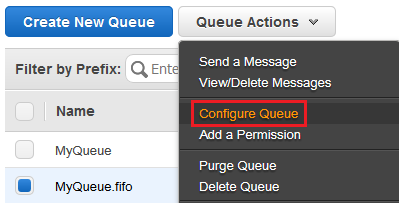 From Queue Actions, select Configure Queue. The Configure QueueName dialog box is displayed. To enable or disable SSE, use the Use SSE check box. Specify the customer master key (CMK) ID. For more information, see Key Terms. For each CMK type, the Description, Account, and Key ARN of the CMK are displayed. If you aren't the owner of the CMK, or if you log in with an account that doesn't have the kms:ListAliases and kms:DescribeKey permissions, you won't be able to view information about the CMK on the Amazon SQS console. Ask the owner of the CMK to grant you these permissions. For more information, see the AWS KMS API Permissions: Actions and Resources Reference in the AWS Key Management Service Developer Guide. To use the AWS managed CMK for Amazon SQS, select it from the list. If you don't specify a custom CMK, Amazon SQS uses the AWS managed CMK for Amazon SQS. For instructions on creating custom CMKs, see Creating Keys in the AWS Key Management Service Developer Guide. The first time you use the AWS Management Console to specify the AWS managed CMK for Amazon SQS for a queue, AWS KMS creates the AWS managed CMK for Amazon SQS. Alternatively, the first time you use the SendMessage or SendMessageBatch action on a queue with SSE enabled, AWS KMS creates the AWS managed CMK for Amazon SQS. To use a custom CMK from your AWS account, select it from the list. For instructions on creating custom CMKs, see Creating Keys in the AWS Key Management Service Developer Guide. To use a custom CMK ARN from your AWS account or from another AWS account, select Enter an existing CMK ARN from the list and type or copy the CMK. (Optional) For Data key reuse period, specify a value between 1 minute and 24 hours. The default is 5 minutes. For more information, see Understanding the Data Key Reuse Period. Your changes are applied to the queue. Obtain the customer master key (CMK) ID. For more information, see Key Terms. To enable server-side encryption, specify the CMK ID by setting the KmsMasterKeyId attribute of the CreateQueue or SetQueueAttributes action. // AWS managed CMK for Amazon SQS. To disable server-side encryption for an existing queue, set the KmsMasterKeyId attribute to an empty string using the SetQueueAttributes action. null isn't a valid value for KmsMasterKeyId. (Optional) Specify the length of time, in seconds, for which Amazon SQS can reuse a data key to encrypt or decrypt messages before calling AWS KMS. Set the KmsDataKeyReusePeriodSeconds attribute of the CreateQueue or SetQueueAttributes action. Possible values may be between 60 seconds (1 minute) and 86,400 seconds (24 hours). If you don't specify a value, the default value of 300 seconds (5 minutes) is used. // a data key to encrypt or decrypt messages before calling AWS KMS again. For information about retrieving the attributes of a queue, see Examples in the Amazon Simple Queue Service API Reference. To retrieve the CMK ID or the data key reuse period for a particular queue, use the KmsMasterKeyId and KmsDataKeyReusePeriodSeconds attributes of the GetQueueAttributes action. For information about switching a queue to a different CMK with the same alias, see Updating an Alias in the AWS Key Management Service Developer Guide.